The Spirit of Cuba represents the most affordable offering from Alec Bradley, taking advantage of the company's access to premium tobacco, while dramatically subduing banding and packaging to allow for a dependable cigar that can be enjoyed on a daily basis. The cigars arrive in three formats: Natural, Habano, and Corojo. While these three terms may often be interchangeable to many smokers, there are key differences that bring a unique feel to each blend. Natural: The Spirit of Cuba Natural is the most mild of the bunch, using a Connecticut Shade wrapper over a Honduran binder and fillers of Nicaragua and Honduras. The flavor profile hovers around notes of barnyard hay, buttered crackers, and table cream. Habano: The Spirit of Cuba Habano showcases a Nicaraguan Habano-seed wrapper and binder, containing fillers of Nicaragua, Honduras, and Mexico. This is a medium-bodied smoking experience, showing flavors of cedar, cabinet spice, earth, and sweet natural tobacco. Corojo: The Spirit of Cuba Corojo is similar to its Habano sibling, but the blend is highlighted by a Nicaraguan Corojo-seed wrapper. The blend is rounded out by a Honduran binder and fillers of Nicaragua and Honduras. This is a medium-plus-bodied cigar, showing notes of black pepper, leather, chocolate, anise, and espresso. Spirit of Cuba Churchill Natural Bundle - 20ct. Spirit of Cuba Robusto Corojo Bundle - 20ct. Spirit of Cuba Robusto Habano Bundle - 20ct. 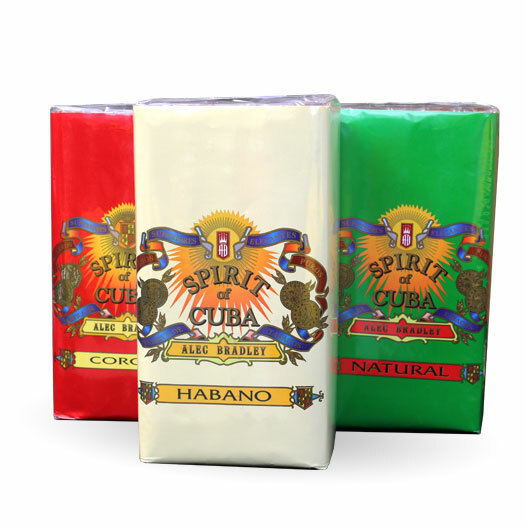 Spirit of Cuba Robusto Natural Bundle - 20ct.